Video game junkies rejoice! Virtual worlds are not just for after school anymore—now they’re part of it. Second Life has made its way into the classroom at Ithaca, where students in the integrated marketing communications program have been exploring its impact on buyer behavior. Last semester, I delved into this virtual culture owned by Linden Research as a member of professor Kim Gregson’s Audience Research class, researching and analyzing interactions between users—known as avatars—and the advertising of popular brands like Adidas, Coca-Cola, and many others. While immersed in a video game atmosphere I got the opportunity to interview Second Life users about their attitudes toward companies that sell and advertise products. A typical day of research consisted of what many students do in their spare time—socializing online and playing games. 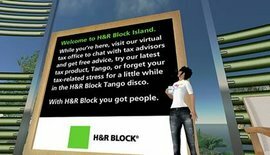 I began my project by visiting virtual places like H&R Block (where I received some useful tax advice that I gladly used when filing my taxes this year). As a Second Life resident, you get to choose your appearance by customizing your avatar to look just like you . . . or maybe not. While exploring other islands in Second Life, I received many virtual promotional items to customize my avatar, including t-shirts, coffee, and even a Nissan car. It was fascinating to analyze my own consumer habits after interacting with various brands. After being given these items in-world I was much more aware of these brands in real life. Second Life is also a popular place to hold events, classes, and business meetings. Holding lectures on Ithaca’s island in Second Life allowed us to accommodate special guest speakers such as Aaron Uhrmacher, senior account executive from the global public relations firm Text 100. Events like these enable students to network with professionals in New York, London, and even Japan without ever leaving campus. I attended two in-world lectures and received internship offers from Text 100. I also made virtual connections with a graphic design firm in Los Angeles. Much like my interactions with other students there, talking with professionals in Second Life allowed easier conversation for both parties involved, and the interaction was even more personal than it would have been on the phone or via email. Interviewing Second Life residents opened my eyes to people’s entertainment, social, and purchasing habits. If I had to conduct these interviews in real life, I don’t think I would have been given the time to ask questions or gathered the same in-depth answers. My immersive experience in Second Life was a lot of hard work but also very exciting and engaging. It focused me on where the future of marketing and technology are headed and challenged me to fully understand consumer behavior within a new social environment.